When asked to put together a DJ mix for the theme “Ice Culture” I didn’t know what to do with it at first. I can’t say that I necessarily relate with the term “Ice Culture.” First of all, I’m born and raised in Iceland, but on the east coast in a tiny town named Seyðisfjörður. There are no glaciers to speak of on the east coast, no geothermal activity or hot springs. In general just not many of the things you see in pictures when you Google Iceland. There are, though, a lot of mountains—and a lot of snow. I grew up doing things that most kids do, going to school, playing music, snowboarding and skateboarding, playing video games and experimenting with life. On a day-to-day basis glaciers are the last thing on Icelandic kids’, teenagers’ and young adults’ minds. As for adults, they don’t even think about them unless necessity calls for it. In the Sagas and literature from the previous centuries the glaciers are hardly mentioned. Maybe it’s because there is nothing there to sustain life for humans or animals. There are no resources to be had and they are a dangerous place to be. It can even be dangerous to be close to them. Why go there? Just stay away. I, at least, didn’t step foot on a glacier until I was around 20 years old. As a young musician (when I was a young musician) the glaciers even sometimes annoyed me more than anything. I’ve played around the world in both an epic and experimental post rock band (MIRI) and also an upbeat electronic party band (FM Belfast). When touring and playing with MIRI I’ve been told we sound so Icelandic. In FM Belfast I’ve been told that we don’t sound like an Icelandic band at all. The truth is that both bands don’t sound Icelandic. They both sound American, Canadian, European. They sound like all the music and art that has inspired us from all over the world regardless of any glaciers that may or may not surround us. Having said all that I think there’s a reason why calypso music sounds like it sounds and Nordic 5th harmony chants sound like they sound. Surroundings, weather, history and nature influence music, of course. Fast forward a few years. I still work as a musician and a DJ—just not a very young one anymore—but I’m also a guide. Specifically a glacier guide. My initial thought about this mix was, “How can I make this without being cliché”? I decided not to try interpret a glacier or Ice Culture through sounds and music. I simply decided to pick songs I listen to on the glacier. When I had compiled a number of songs and thought of adjectives to describe the songs in the mix the words I came up with were: “ambient, cold, eerie, ethereal, silent, vast, synthetic, epic, hypnotic, dramatic.” There’s not a lot of organic or live sounds in there. Little human voice or guitars. I realized that the mix was exactly what I didn’t want it to be… a cliché. I guess clichés are clichés for a reason. When looking over the list of adjectives I realized I could also use all of them to describe a glacier. 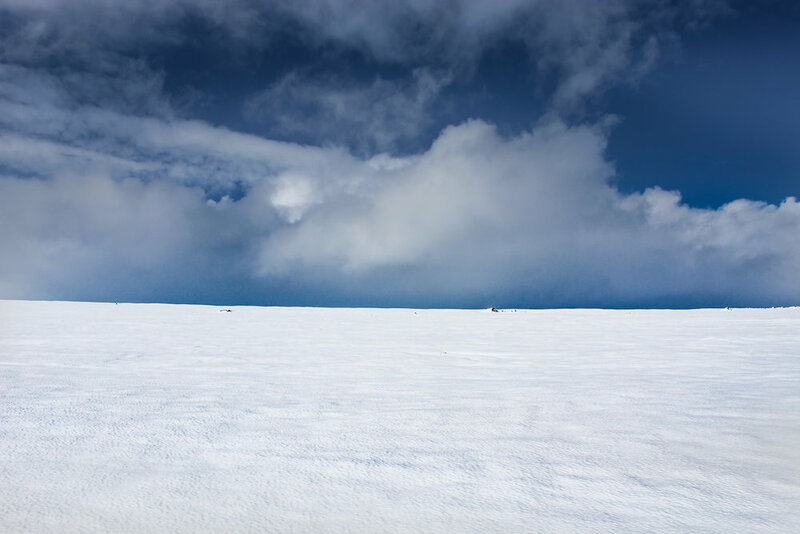 There have been times when I have been the only person on Langjökull (the second biggest glacier in Iceland) for a while and that feeling is weird. I listen to all sorts of music in general, ranging from very organic folk to the strangest mechanic experimental music, but it just doesn’t make sense to listen to any other kind of music than portrayed here when one is on the glacier. So, I present to you, my soundtrack to the glacier. Enjoy. Ívar Pétur Kjartansson is a member of the Icelandic band FM Belfast; a DJ; a glacier guide and the operator of On Tour with Ívar, a Reykjavik city walking tour featuring art, food and music. He grew up in the beautiful town of Seyðisfjörður in the east cost of Iceland, a town well known for its lively art scene and creative energy.